It’s a great question, but I’m afraid it’s one I can’t answer. Many of the people I have spoken with have had enough of working for someone else, feeling limited in what they can achieve, or never having time for what’s important, and see their own business as being a way to change that situation for the better. The only trouble is they don’t know what business to start or how. In this post, I’ll help guide your thinking so you can determine for yourself what business is right for you. Here are some of the questions that will help you ‘do your homework’ and find your ideal business. There are a great many ways to make money, but you need to start a business you love to ensure you will work at it consistently. Being passionate about what you do will also help you to stay motivated and focused, and help you engage others with your enthusiasm and joy for what you do. As your own boss you get to choose what you do, so choose something you love – otherwise, there’s not much point and your business won’t make you feel happy and energised. While you can certainly learn skills during your entrepreneurial journey, in my opinion, it’s far better to base your first business on something you are already good at – as long as that’s something you also enjoy. Knowing you already have some key skills will help you start your business with confidence – and confidence is extremely important, especially in the early days. If you don’t believe you can do a good job, then your clients are never going to buy into your business. Your values are what’s most important to you. Take some time to identify what your values are and find a business that is closely aligned with these – that will be your ideal business. This is important as you need to champion your business in the marketplace, and it’s hard to do this with authority if you can’t stand 100% behind what you are offering. What type of person do you want to help with your offer? Your ideal business will be one that’s centered around your customers’ needs and preferences, so it’s important to know exactly who they will be and that they are a group of people you enjoy hanging out with and helping. 1. The NEED for what you do. 2. Your ABILITY to do it. 3. The DIFFICULTY there is in REPLACING YOU. So if you want to earn a lot of money, it’s important that you start a business that solves a clear and valued client need, that works to your strengths and that you can deliver in some unique way. And then set about making sure that you keep getting better and better at what you do. The amount of money you need to make will also help determine the exact business you start, not all businesses are capable of delivering the same return or within the same timeframe. Some businesses are riskier than others. How much risk are you willing to take right now? The answer to that question might already eliminate some of the options on the table. Your ideal business will be one that has the right balance between risk and security for you. 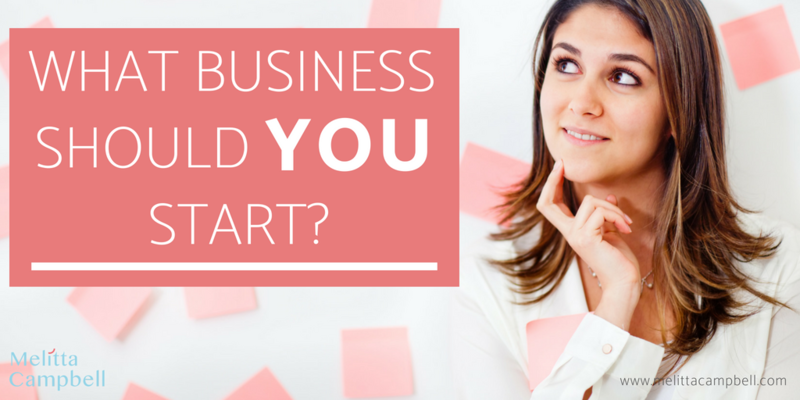 How much time would your ideal business take up? Are you looking for a full- or part-time business, or just something you can do on the side of your current commitments? Do you what to start small, and scale-up gradually? Knowing what you can consistently commit to will help you make the right decision. So, what business are you going to start? I’d love to know what business you are interested in starting, let me know in the comments below! If you need help turning your idea into a thriving business, my 90-Day private business coaching can help you put your anxieties behind you, devise a solid ‘blueprint’ to guide you every step of the way and help you can start attracting your dream clients. You can read more about the program here: Your Business Blueprint to More Dream Clients or contact me to book your free 30-minute discovery call to learn more. wow, very powerful insight!!! I am actually looking forward in implementing these points because I am an artist and I totally understand that motivation towards what I am good at is important. I am just facing problems because I am in India and my bank is not Paypal friendly. I just don’t know how to get over this dilemma!!! Thanks Nain, glad you enjoyed it. its a great article you shared, that’s why love your blog post. Thanks for sharing and its very helpful. Thanks Jina, so glad you liked the post. This is exactly what I need right now, thanks for sharing! Lots to think about! I’ve already started my business, so this really just helped me confirm that I’m doing the right thing!